With that little nitpick out of the way, the main issue I had with the game is that although it went with a neat visual aesthetic based on ancient Greek black figure pottery, it didn’t really do much else interesting with it. The story is largely set on Mount Olympus and involves confronting various gods from Greek mythology, but it is not based on any one myth. 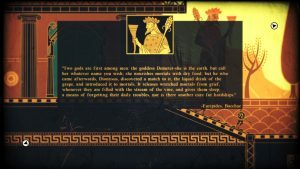 There are a few aspects of the game that are somewhat inspired, like the battle against Artemis, the Goddess of the Hunt, but most of it handles its Olympian world in a superficial way. Little placards are scattered all over the game’s world with quotes pulled from ancient Greek texts, but other than describing the characters, at best they just barely tie into the story, and mainly serve as an educational component for those unfamiliar with the likes of Persephone and Dionysus. Aside from all that, it plays fine (well, once I got it to run. I had to install and play it in Mac OSX because certain particle effects made the game crash in Windows), and the inventory system is cumbersome but not terrible. It’s not a bad game, but playing it, I couldn’t help thinking of how much better it could’ve been. Much more interesting were two Nintendo-published character puzzle games. The first I beat (technically; there was a lot more game to play after the credits rolled) was the Switch version of Captain Toad: Treasure Tracker, a colorful set of item-collecting puzzles in miniature 3D worlds. It’s quite fun, with that cheerful Super Mario aesthetic and various challenges on top of the baseline “get to the star at the end of each level”, with the main one being picking up sets of three gems. As hinted at earlier, the main game is quite short, but the postgame is much bigger, with more than twice as many puzzles and a separate bonus section featuring minigames, some level remixes, and new stages inspired by Super Mario Odyssey. The second game was BOXBOY! on the 3DS, developed by HAL Laboratory. The graphics, which mostly consist of simple black and white shapes and line art, are like night and day compared to Captain Toad‘s, but the puzzles are no less expertly crafted. 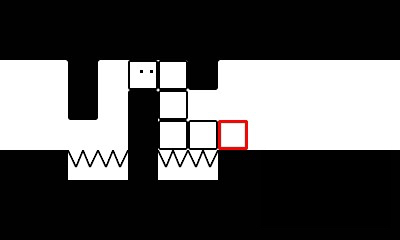 The title character’s main abilities are creating boxes out of his body and forming them into different shapes; the total number of boxes (which are limited until all the crown items are collected) and sizes of the shapes he can create are determined at the beginning of each level. Boxboy can use his boxes to make stairs and bridges, sneak through tight corridors, and overcome all sorts of other obstacles. As in Captain Toad, there isn’t much of a story, mostly just pure character-based puzzle action. You really can’t go wrong with either game if you like this sort of thing. For the next game I beat, I went back to Windows (in this case, after disliking certain default settings in the Mac version). Said game is free, barely two weeks old, and is titled Deltarune: Chapter 1. As the follow-up to Undertale—which it may or may not be related to—one would naturally have a lot of expectations going in, but thankfully, it doesn’t disappoint. It is different from Undertale, not just in how it plays (you can have a battle party now! ), but also in its tone. However, Deltarune is also the same in its proliferation of puns and other goofy bits of humor, plus it contains some specific callbacks to its predecessor. As with Undertale, I don’t want to spoil much and recommend that you play it yourself. It will probably take years before this new saga is complete, but I have a feeling the wait will be worth it. Afterwards, I rotated back to the Switch and started Adventure Mode in Puyo Puyo Tetris. I love Puyo Puyo, but am pretty bad at it. Fortunately, this game’s Adventure Mode wasn’t so tough that I couldn’t beat it. As it turned out, certain Tetris-focused stages gave me the most trouble, though the Puyo Puyo ones are no slouch either, especially in the other single-player modes. 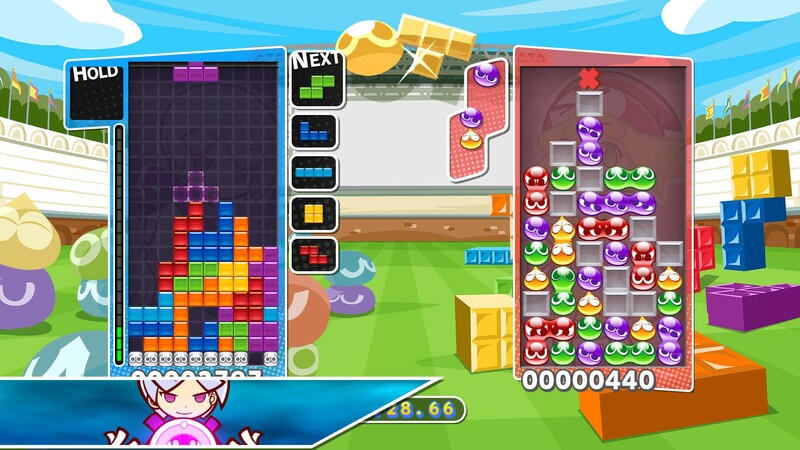 There are a handful of ways to play which combine the two, but the “Fusion” mode which combines Puyos and Tetriminos in the same playfield is particularly chaotic, even after one figures out how it all works. 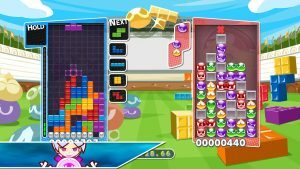 In Adventure Mode, cutscenes are scattered in between the challenges, telling a kid-friendly story of the Puyo Puyo and Tetris worlds colliding. For the most part, it’s a silly and cheerful tale, though the shrill voice acting for certain characters can be a bit too much at times. A sizable chunk of postgame levels unlock after Adventure Mode is wrapped up, but I don’t feel like tackling them anytime soon. We’ll see if I ever do. And that takes us to the games I’m currently playing. As usual, there’s Pokemon GO, which has kept me busy with special events, the releases of more Shinies, and a handful of raid battles, including one which resulted in my finally catching my favorite Pokemon, Absol. 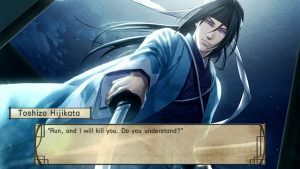 Back in the single-player, offline realm, I’m currently wrapping up a route for the first time in Hakuoki ~Stories of the Shinsengumi~ on PS3. I recently described Hakuoki to someone as “the Skyrim of otome games” because since its original release on PS2, it has appeared on at least ten other platforms, the most recent versions being on the Switch in Japan, and Windows and the PS Vita in the West. After playing through a good chunk of it, it’s fairly easy to see why this visual novel has enough of a following that it gets so many rereleases: the story is dramatic, action-packed, and engaging and the characters are likable—even the heroine, who doesn’t seem to suffer from the doormat syndrome which apparently plagues those in other otome games. Unlike Apotheon, which only references Greek myths on a surface level, several historical events from this period in Kyoto’s history are woven into the overall story. The fictional bits include not only the crossdressing heroine’s presence at Shinsengumi headquarters, but also certain supernatural elements she gets involved with. 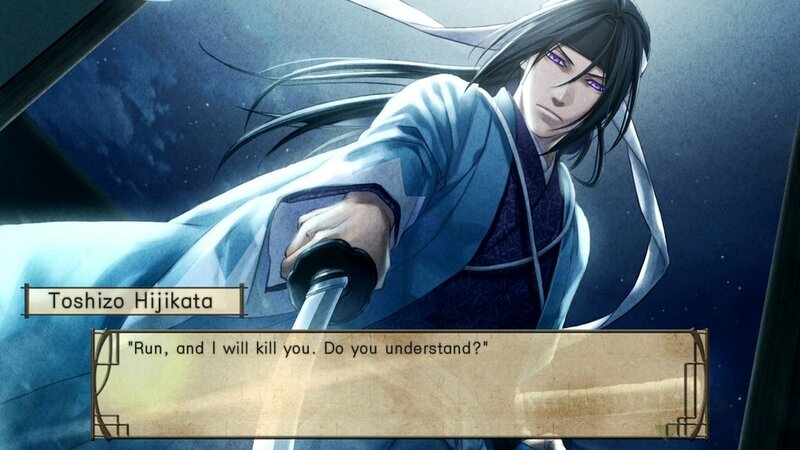 On the aesthetic side, Hakuoki has some excellent Japanese voice acting, but stumbles a little in the art department. Several secondary characters don’t have lip moments like the main ones do, or only have them for one or two poses, and backgrounds don’t always match the seasons that their scenes take place in. On another note, there is an optional “breathing” animation setting, which I quickly turned off because it looked so weird in motion. The music is nothing special, unfortunately; as for Aksys’ localization, it has a few flaws, but is otherwise serviceable. Right now, as I ended the third chapter without successfully triggering one of the five main guys’ routes, I’ve started the sixth, which involves a character I’m not too fond of. The plan is to wrap that up, then, with liberal use of “skip previously read text” feature, to go back and try for at least one more ending. The PS3 version also includes a set of side stories, which I may delve into at some point. As for any other games I may start, it’s been awhile since I’ve played a nice, lengthy JRPG, so something along those lines might be in my near future. As we settle into November, keep warm, and happy gaming!